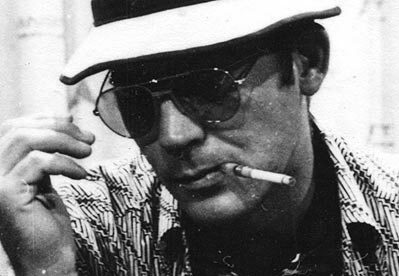 “The edge… There is no honest way to explain it, because the only people who really know where it is are the ones who have gone over.” Lightning-powered by a hot cocktail of tequila, mescaline, anger and idealism, Hunter S Thompson spent his life hunting that edge. But as Alex Gibney’s overlong documentary does make clear, Thompson’s deadliest vice wasn’t substance but style: it was fame that fried his brain more than drug or drink. Long before putting a bullet through his skull in 2005, Thompson became a prisoner of the legend he’d created. Collaging copious archive material (home movies, photos, TV footage and voice recordings, narrated by Johnny Depp), the Oscar-winning director of Enron and Taxi To The Dark Side makes some attempt to rescue the man from the myth. The man who owned 22 guns. Who drank a bottle of whiskey a day. Who taught himself to write by typing The Great Gatsby again and again. Or did he? Either way, Gonzo reminds us how short Thompson’s journalistic purple-patch was – and how florid. From the mid-‘60s to the mid-‘70s, he wrote a trilogy (Hell’s Angels , Fear And Loathing In Las Vegas , Fear And Loathing On The Campaign Trail ’72 ) that formed a savage eulogy for wilting Flower Power and launched a two-thumbed fist at the throat of Richard Nixon. Whether riding with killer bikers or delivering “the most accurate and least factual account” of the 1972 election season, his style bear-trapped vital cultural truths with devastating accuracy and psychedelic wit. With Hunter’s wives and son, illustrator Ralph Steadman, Rolling Stone founder Jann Wenner and ex-president Jimmy Carter all chatting freely, Gonzo seems to have everything. Yet it misses so much. Instead of constructing a nuanced character study, Gibney breezes Thompson’s early days and races through the last 25 years of his life. It’s a surface skim of his fascinating contradictions rather than a search for deeper truth – and that, of course, was what gonzo was all about. A straight-line journey through the Good Doctor’s loopy myth and madness, but one that never gets close to edge of this anarchic rebel-sage and his crazed quest for freedom and truth.